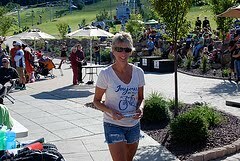 Mountainside Ski & Sports Cycling: Mountainside Races to the Finish! Mountainside Races to the Finish! It may not make the September cover of Dirt Rag or be the feature article on the IMBA Facebook page, but there is no doubt that the 2011 Mountainside Mt. Bike Race Team gave it their all this season, especially at the MASS Finals at Bear Creek. The only way to start this article off is the way you start mt. bike races, you typically put the best first. 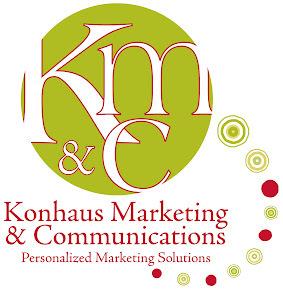 So the first thing to do is highlight two of the best ... Mike Laub and Janice Morris. There is no question that winning is the prize jewel, but sometimes the real "winning" isn't a result of a 1st place trophy, but maybe it's about the intestinal fortitude and down-right "digging-deep" to get the job done. 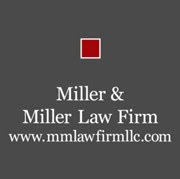 Both Mike and Janice were subject to mechanical problems at Sunday's race. Even with a flat in the first lapfor Janice and a run down the mountain and back up for Mike to fix a chain, both finished with impressive times and proved once again why they lead such a successful race team. Mike finished 19th in the Elite Open Men and Janice swept up 6th place in the Women's Elite Class. A big "Thank you" to Mike and Janice for a great season and for showing us what it means to be the best! The Mountainside men had a stellar day at Bear Creek. Andy Hoover ripped the 3-lap course with a time of 2:28.39 and took 10th place in the Elite Men's Open Class. 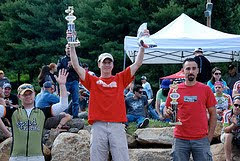 Andy then took center stage as the Champion for the Individual Endurance Series with a point total of 1,674. You would almost think he is a native to Bear Creek with a super fast time of 2:30.15, but quite the contrary, Chad Cherefko never raced or even rode this course prior to Sunday. 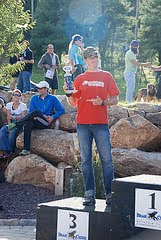 Not only did Chad have his best race of the season that day, but he also swept up 2nd place in the Men's Expert Class 19-39 and took 3rd in the overall Cross Country Series for Expert Men 19-39 with a total point score of 1,899. To Mike Funk - apparently blue is his color. It has to be because he simply refuses to take anything but 1st. 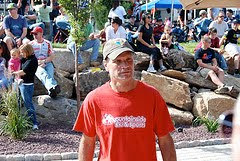 Mike once again took 1st place in the Men's Expert 50+ Sunday with 2:32.47 registered on the clock. Wait, he's not done yet, Mike also was the Champion for the Men's 50+ Cross Country Series with a total accumulation of 2,415 points. Nathan Goates raced in the Expert Men's 19-39 Class and rode to an impressive 12th place finih with a time of 3:01.22. Sally "Speedy" McClain led our women to some awsome finishes for the day. 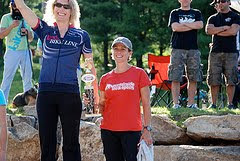 Sally traded places through the race with competitor Susan Mrugal and she came away with a tough fought 3rd place overall for the Women's Elite Class and tore up the course with a time of 3:02.33. 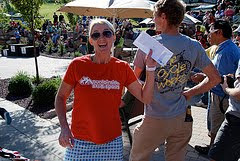 But Sally wasn't finished with the podium yet, she also took 2nd in the overall Women's 40+ Elite Cross Country Series. No doubt this woman thrives on the gnarliest of trails. Awsome job Sally. Melissa had one of her personal best races of the year as well. Melissa finished 2nd in her class andd 4th overall for the Women's Elite Class with a time of 3:16.11. To her surprise, Melissa also took 3rd for the Women's Elite Under 40 Cross Country Series. It was a very satisfying finish to her first year racing in the Elite Class. In the Sport Division, Ben Moore represented Mountainside well with a time of 2:47.26. Ben has been a solid racer in the Sport Division and has helped Mountainside with additional points. All this indivual effort brings us to the team awards. 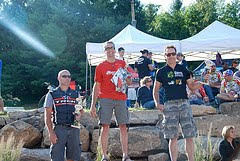 Mountainside went pedal to pedal with Bikesport for 1st place in the Cross Country Series and the Endurance Series. 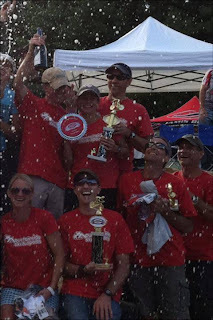 After tallying all race points, Mountainside took 2nd to Bikesport in Cross Country and 1st in the Small Team Endurance Series for an overall 2nd place in the Endurance Series, which includes all the big teams.All team members agreed that we gave it our best and applaud Bikesport for their 1st place finish. Now that the dust on the trails has settled, next year's goal is within site - 1st place! 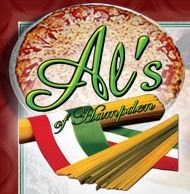 Nice job Team! Be proud of yourselves.